EULITHA, a Swiss startup company offering innovative lithography equipment and services for the nanotechnology, photonics and optoelectronic markets announced today the delivery of its unique PhableR 100 photolithography tool to the MESA + NanoLab of the University of Twente in the Netherlands. 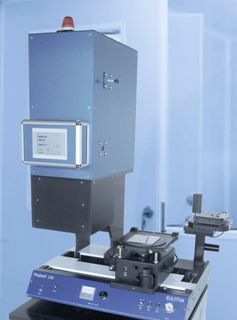 The system incorporating Eulitha’s proprietary Displacement Talbot Lithography technology will enable researchers of this interdisciplinary research institute to perform high resolution lithography on different substrates without the severely limiting requirements such as flatness or conductivity one faces with previously available technologies. The PhableR 100 system is capable of exposing periodic patterns down to feature sizes below 150nm which rivals high-end i-line steppers. The patented focus-free imaging technology used by the system enables uniform printing on non-flat samples often found in photonic and optoelectronic sectors. Christian Dais, head of photolithography equipment production at Eulitha, said "This order from a prestigious European research institution shows the potential of our innovative technology and equipment in a research setting. We will be collaborating closely with researchers at the NanoLab for the most effective use of our Displacement Talbot Lithography technology. We believe our system will prove to be an excellent alternative to costly steppers or complicated laser interference setups used by many institutions and companies for creating high-resolution periodic structures.” Eulitha had previously announced the sale of one of their lithography systems to a specialty optics production company based in China. Eulitha AG is a spin-off company of the Paul Scherrer Institute, Switzerland. It specializes in the development of lithographic technologies for applications in optoelectronics and photonics. It produces and markets nano-patterned samples and templates using its own PHABLE tools and state-of-the-art e-beam lithography systems. PHABLE is a registered trade mark and the brand name of Eulitha's proprietary photolithography platform, which includes exposure tools and wafer patterning services.